Contact us for volume pricing on orders of 4+ Pallets. 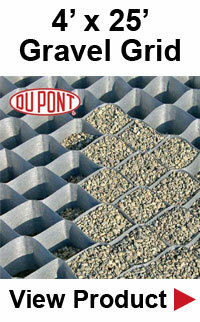 TYPAR BodPave 85 porous pavers are a ground reinforcement paving grid system manufactured from recycled HDPE plastic. 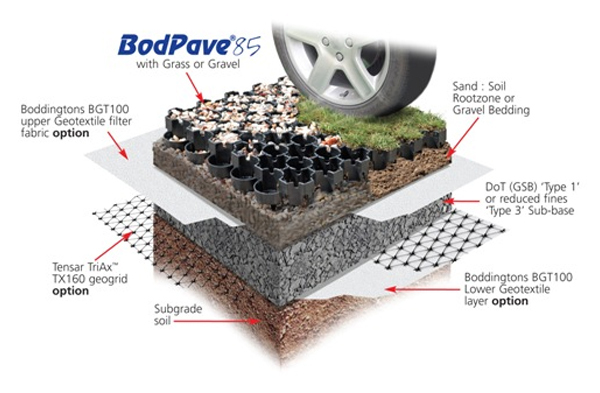 TYPAR BodPave 85 porous grass / gravel pavers / paving grids inter-connect with each other to provide a very strong stable surface capable of withstanding heavy vehicle loads. The porous paving grids can be filled with gravel, grass or a soil / rootzone to provide a gravel or a natural grass surface. Applications include regularly trafficked areas (pedestrian and vehicles), overflow grass parking lots, golf cart paths, grass fire truck lanes, wheelchair / handicap paths and grass driveways. TYPAR BodPave 85 permeable pavers can be installed with either a grass or gravel filled surface depending on the application required. TYPAR BodPave 85 is available in black, green and natural white and is manufactured from UV Stabilized 100% recycled HDPE. TYPAR BodPave 85 porous paving grids are strong, chemically inert & non-toxic and provide a durable, safe and eco-friendly surface for trafficked areas. 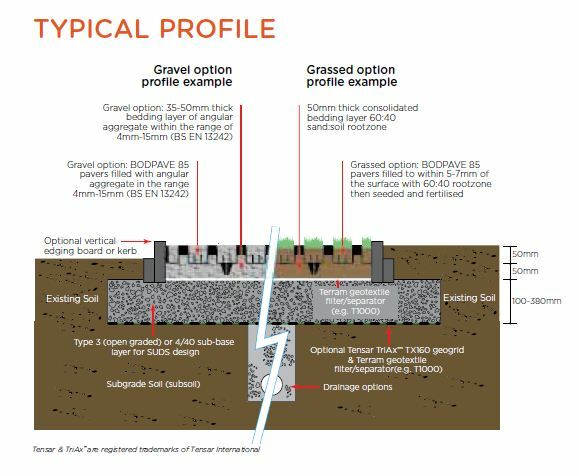 TYPAR BodPave 85 grass pavers offer a cost effective solution to reinforcing and stabilizing worn or rutted grassed areas where requirements are for rainwater to enter the ground where it falls, particularly as part of LID / NPDES specifications for water management. For full installation instructions and guidelines download our Specification, Design & Installation Guidance documents which can be accessed through the installation section below.